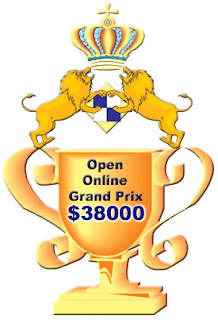 The final qualification for the Online Chess Blitz Grand Prix Open 2012 took place on August 14. Four groups of 12 players each participated. Best two players from each of the groups would play the Super Final Tournament on August 15 at the ChessOk.com platform for online chess. Group 1: 1. Volkov – 7.5; 2. Amonatov – 7. 3-4. Pridorozhnyi, Zhigalko – 6.5 each; 5-6. Papin, Smirnov – 6 each; 7-8. Ponkratov, Kharitonov – 5.5 each. 9. Rahmanov – 5; 10. Kiselev V.– 4.5; 11-12. Mischyk and Kovalev V. – 3 each. Group 2: 1. Andreikin – 10.5; 2. Kovalenko – 8; 3. Khismatullin – 7; 4. Fedoseev – 6.5; 5. Yudin – 6; 6. Turov – 5.5; 7-8. Korobov, Badmacirenov – 5 each; 9. Zinchenko – 4.5; 10. Kharchenko – 4; 11-12. Grischenko, Khasangatin - 2 each. Group 3: 1. Grishuk – 9; 2-3. Safarli, Deviatkin – 8.5; 4. Bocharov – 7.5; 5. Panarin – 6.5; 6-7. Azarov, Schaposhnikov – 5 each; 8-9. Galkin, Onischuk.V – 4.5 each; 10. Linchevsky – 4; 11. Kononenko - 2; 12. – Liascovich Lucas – (could not participate). Group 4: 1. Zubov - 9; 2. Andriasian – 8.5; 3. Grigoryan – 7.5; 4-5, Bukavshin, Sjugirov – 6.5 each; 6-7. Terry, Vovk – 5.5 each; 8-9. Timofeev, Guseinovr – 5 each; 10-11. Kokarev, Ovetchkin – 3.5 each; 12. Dlugy – (could not participate). The Super Final Tournament will employ the Knockout system (4 games, Armageddon game if the score is 2:2). The players will start in the quarterfinals in the following pairs: Volkov - Safarli, Zubov - Kovalenko, Andreikin - Andriasian, Grishuk - Amonatov. Watch the Super Final Tournament broadcast in the Tournaments & Broadcasts section of chessok.com, August 15, at 15-00 UTC.